Okay! Musume Time: Niigaki Risa and Mitsui Aika have Graduated Morning Musume. Niigaki Risa and Mitsui Aika have Graduated Morning Musume. 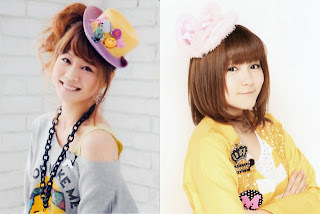 Today, on May 18th 2012, Niigaki Risa and Mitsui Aika have both officially graduated from Morning Musume. Whilst Risa is also leaving H!P to pursue a career in acting, much like her Gen 5 companion and best friend, Takahashi Ai, Aika will continue to be a part of Hello! Project. Whilst it is unclear what Aika will be doing, it is wonderful to know that she can still be a part of the agency. I wanted to make a really formal post saying nice things and what not, but seriously, I am sad. I cried at around 5am in the morning when I first thought about it, and then I went to sleep. After waking up I am still really sad about it, because two really great members have now left Morning Musume, and are going to do new things and improve themselves more. Graduations are always sad things, though I've never experienced losing a member I loved so much until now. Both of these girls are special to me in their own ways, with Gaki being a bit more important to me - but to have Aika graduate so suddenly was shocking and heart breaking. In fact, Gaki's graduation announcement was also a big surprise and a shock. Many had thought that she would lead MM for another year, but she left this year instead. However, I am so happy that Gaki was able to be a leader, even if it was for a short while. I wish I could say the same for Aika, because I was anticipating her leadership years. But, as I said in her appreciation post, that will never happen, and it is very sad. These two have been a big part of Morning Musume for so long now. Aika may have been in for less time than the other OG members, but she has certainly made her mark, or at least to me - These two girls are both so wonderful and loving, and it is so sad to see them graduate. But, that said, I am happy that they are graduating together, because they are so similar in their love and dedication for Morning Musume. They are both wonderful girls, and they have really cherished Morning Musume from the days that they both were accepted as members of this great group. In the end, this has to happen - and it's sad that Aika went so soon, but I do think that this is for the best. This is so that the new Morning Musume can grow even more quickly. Niigaki Risa and Mitsui Aika graduating is now the beginning of a new era. With whatever they do, all of us fans can only wish them luck and to look forward to their futures and what they do afterwards. Niigaki Risa, Mitsui Aika... Omedettou! And now it's time for the reign of the BUNNIES, BETCHES! WHOO! USA-CHAN PEASU! LONG LIVE THE QUEEN!